FIRST IN PLAYBOOK — SPEAKER NANCY PELOSI won’t be changing her flying habits now that she has regained the speaker’s gavel. The California Democrat “intends to travel commercially,” according to her deputy chief of staff Drew Hammill. The speaker can make use of an Air Force jet to travel around the country given she is second in line to the presidency. PELOSI used military planes to fly back and forth to San Francisco during her early years as speaker the first time around, drawing criticism from some quarters. Pelosi and her predecessor Denny Hastert used the military planes for security reasons at the direction of the House sergeant-at-arms. JOHN BOEHNER and PAUL RYAN both opted against using government-funded private jets during their speakerships, though both used chartered planes for some political travel. Pelosi has always traveled commercially for political travel. SHUTDOWN … DAY 15 … WHERE THINGS STAND: THE WHITE HOUSE is hosting a meeting of leadership aides this morning to try to find a way out of this shutdown, which is now starting its third week. There seems to be cautious optimism from some — the White House, House Republican leaders — that a deal could come soon. We are a tad more skeptical. THE STALEMATE LOOKS LIKE THIS: PRESIDENT DONALD TRUMP is still demanding $5.6 billion for a wall, and says he’s comfortable dragging this out for a while. NANCY PELOSI and Democrats want the president to reopen government while continuing to negotiate on the Homeland Security bill. Republicans say they won’t reopen government in bits and pieces. THE BIG QUESTION … Is there any formula where Democrats can say they didn’t build a wall, Republicans say the same initially, with a wink and a nod that indeed they are? Trump couldn’t come out and say there’s a wall in this construct. But can there be some sort of sleight of hand of some sort? KEEP IN MIND: Even if a deal is reached today or tomorrow, we’re likely looking at a mid- to late-week vote next week. But there’s no obvious sign there will be a breakthrough. ANDREW RESTUCCIA, “Trump claims support from past presidents for the wall: Clinton, Bush and Obama beg to differ”: “President Donald Trump claimed without evidence on Friday that past presidents have privately confided to him that they regret not building a wall along the U.S.-Mexico border. But at least three of the four living U.S. presidents — Bill Clinton, George W. Bush and Barack Obama — did no such thing. 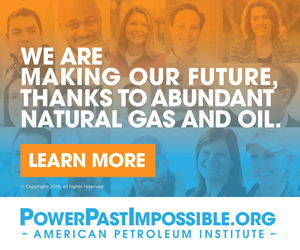 Welcome to America’s Generation Energy, led by the women and men of the natural gas and oil industry, who are meeting unprecedented consumer demand for affordable and reliable energy while reducing the U.S. carbon footprint to its lowest level in a generation. See how we’re doing it and join us at PowerPastImpossible.org. ON RASHIDA TLAIB … When Rep. Joe Wilson (R-S.C.) shouted “You Lie” during Barack Obama’s address to a joint session to Congress in 2009, it caused an international firestorm. Wilson, a relatively mild-mannered congressman, later apologized. But the next week, House Democrats passed a resolution of disapproval. — THIS WEEK, MICHIGAN DEMOCRATIC REP. RASHIDA TLAIB said “we’re going to impeach the motherf***er” and there will be no repercussions. Zero. Criticisms are met by scuffaws, since there’s so much vulgar language everywhere — even the White House. The president directs his venom everywhere. He’s gone after cancer-ridden patients, dead people and many others. When he calls someone out, it mostly rings hollow. After 24 or 48 hours, this thing will be done, and Tlaib will be like any other member of the House. SURE, cable will have fun with this. But, in reality, she’ll raise more money and will actually be rewarded by this. Good Saturday morning. SPOTTED: MICK MULVANEY having dinner last night with REINCE PRIEBUS at the Trump hotel … SECRETARY OF STATE MIKE POMPEO and his detail leaving the CVS on M Street across the Four Seasons. SNEAK PEEK … ANNA spoke with HOUSE APPROPRIATIONS CHAIRWOMAN NITA LOWEY (D-N.Y.) for next week’s WOMEN RULE podcast. Lowey is the first woman to chair the powerful panel since it was created in 1865. Yes, you read that right — 1865. Subscribe to Women Rule podcast to listen to the podcast Wednesday. UPDATE … BEN SCHRECKINGER: “NASA invite to sanctioned Russian official postponed indefinitely”: “The Trump administration has indefinitely postponed a proposed visit by a sanctioned Russian official to the U.S., a spokeswoman for NASA said on Friday. The indefinite postponement could throw a wrench in U.S.-Russia space cooperation and represents a setback for Vladimir Putin’s efforts to undermine U.S. sanctions. WSJ’S MIKE BENDER: “FBI Investigating Fake Texts Sent to GOP House Members: Person impersonating aide to Vice President Mike Pence sought whereabouts of certain lawmakers”: “The [FBI] is investigating fake text messages sent to some House Republican lawmakers from someone impersonating a top aide to Vice President Mike Pence, according to people familiar with the matter. “Several House Republicans have received the texts, and at least one member has been repeatedly engaging with the imposter, who posed as Alyssa Farah, Mr. Pence’s press secretary and a former House staffer, one of the people said. 2020 WATCH … NATASHA KORECKI’S IOWA DISPATCH on the ground in Council Bluffs: “SEN. ELIZABETH WARREN landed here Friday evening, becoming the highest profile potential 2020 candidate to hit this first presidential state this year. About 500 people turned out to the Thunderbowl for Warren’s first event. The room, booked inside of a bowling alley, was quickly at capacity – a line snaked along the entirety of the building and into the parking lot outside. “A few dozen supporters couldn’t make it inside but still stuck around during the unseasonably warm evening and watched through a garage door opening to the room. Warren focused her talk on economic populism that’s a central tenet of her lifelong work and emphasized the need for a grassroots campaign. FACEBOOK VS. NYT – NBC’S DYLAN BYERS: “Mark Zuckerberg and other Facebook executives are fed up with The New York Times after weeks of what they see as overtly antagonistic coverage that betrays an anti-Facebook bias, several sources at the social media giant tell me. FIRST IN PLAYBOOK: TOM DAVIS, the former Republican congressman from Virginia, has started as a senior partner at Holland and Knight. He will be working on government relations, congressional investigations, tech M&A and land use law. He previously was managing director of federal government affairs at Deloitte, where he spent 10 years. JAY SURES, co-president of UTA, has been appointed by outgoing California Gov. Jerry Brown to the University of California Board of Regents. “Mack on Politics” weekly politics podcast with Matt Mackowiak (download on iTunes, Google Play, or Stitcher or listen at MackOnPolitics.com): Steve Forbes. Welcome to America’s Generation Energy, led by the women and men of the natural gas and oil industry. Together we power modern life by delivering the fuel, power, products and innovation that are connecting us and making lives safer, healthier and more affordable. America’s abundant natural gas and oil are creating jobs, supporting communities and the economy, strengthening U.S. security and developing the technologies of the future. Generation Energy is solving complex problems, meeting unprecedented consumer demand for affordable and reliable energy while reducing the U.S. carbon footprint to its lowest level in a generation. With smart trade, infrastructure and regulatory policies, Generation Energy is poised to accelerate U.S. energy leadership and build on the environmental progress we’ve achieved. See how we’re doing it and join us at PowerPastImpossible.org.